Fall is already in full swing in Frankfurt and out come the fall boots and heavier jackets. I was feeling inspired by a cake on Clockwork Lemon so I thought I would take chocolate leaves, inspired by autumn colours to the world of cupcakes, so off I went to collect some. After running into some technical difficulties (the leaves were too high to reach), I managed to find some other trees with lower hanging leaves. I brought home my colourful collection and this is what I did. Wash leaves and pat them dry. Ensure when you collect the leaves, you get ones with really visible veins. 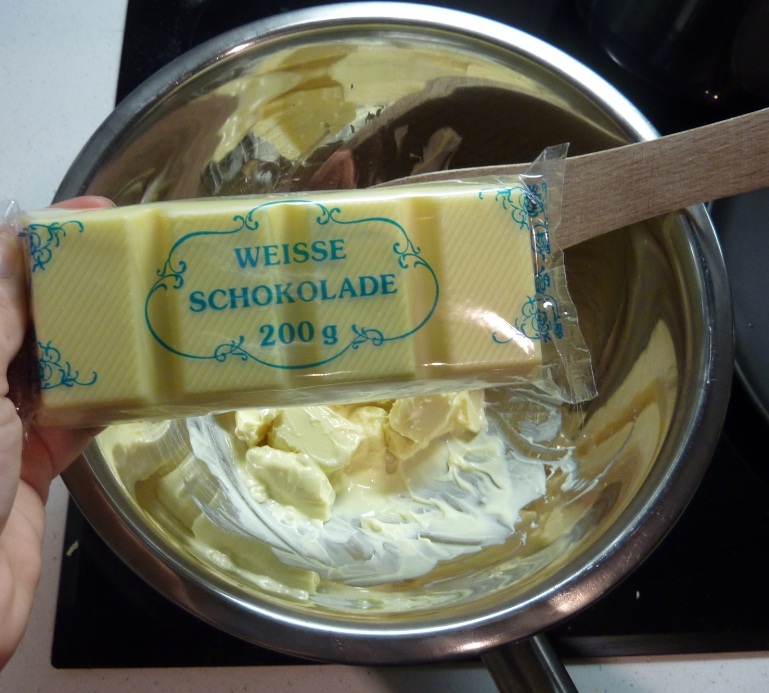 Melt white chocolate using the double boiler method (i.e. melt chocolate in a heatproof bowl over a pot of simmering hot water). Divide up your melted chocolate into little glasses or small bowls. 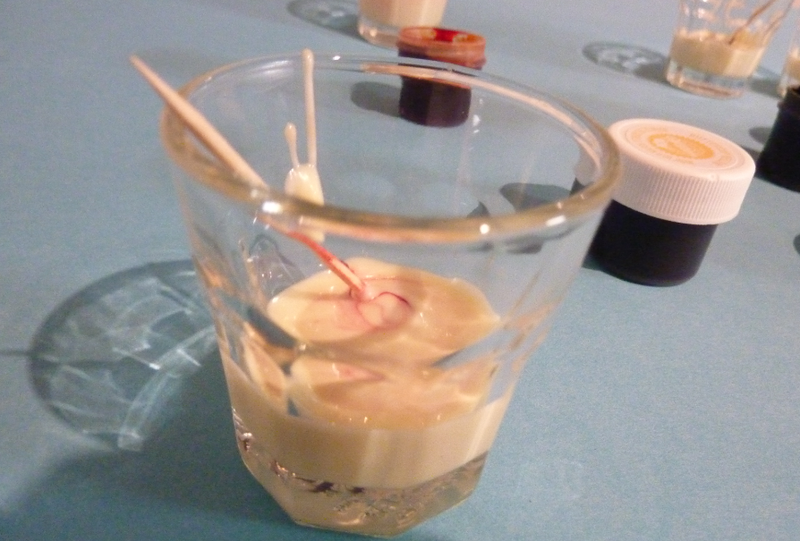 Using a toothpick, add food colouring paste to the white chocolate. Please don’t use liquid food colouring, otherwise the chocolate will seize up on you. This is when the chocolate you are melting suddenly becomes grainy and firms up, looking like a dull, thick paste and you can longer work with it. Make some nice autumn colours. 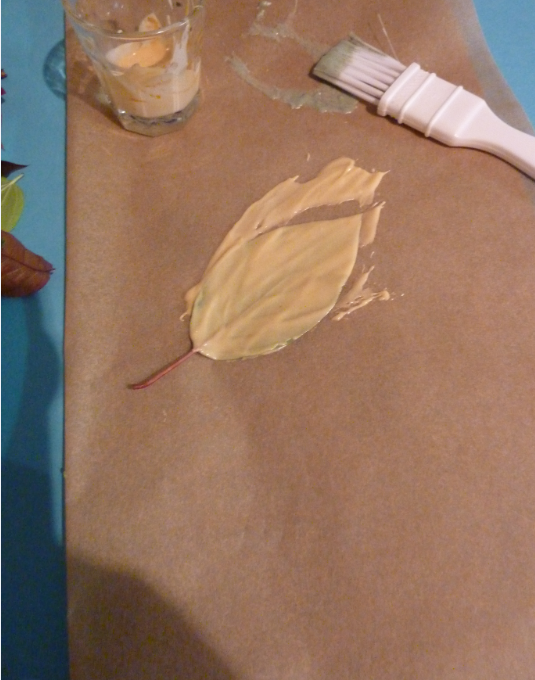 Using the Wilton buttercup yellow created a really nice autumn yellow. I also added it to the red and the orange to also make them more golden-y. Using a pastry brush or the back of teaspoon also worked very well, apply the coloured chocolate to the back of the leaf, where the veins are most visible. I found that using bigger leaves and at least 2-3 applications of chocolate worked best. 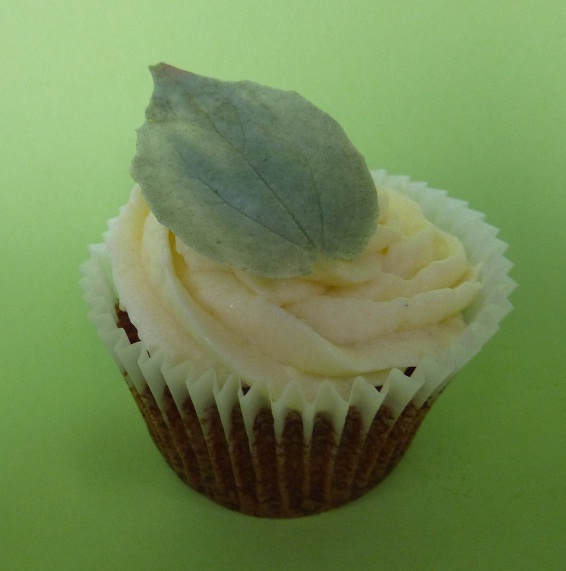 The smaller leaves didn’t work so well, the big leaves where too big for cupcakes however the medium leaves were juuuust right. And by three applications, I mean, put them in the fridge for drying after each application and reapply the next coat onto the dried chocolate. Let the chocolate covered leaves dry on Backpapier (parchment paper) in the fridge. Take out them out of the once the last coat has dried. Overall, the drying of each coat takes about 5-10 minutes. So after about 30 minutes your leaves should be ready. I left my leaves in for another hour after that just to harden them up even more. 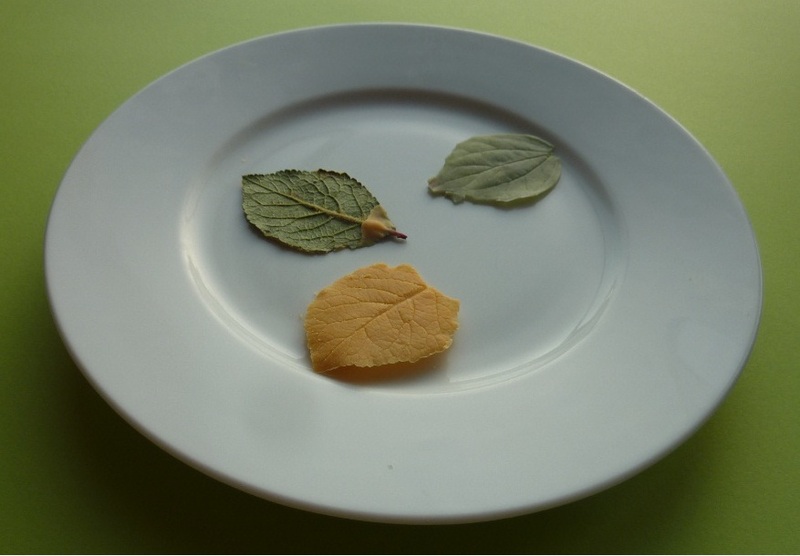 So after this hour and half, take the leaves out and gently peel the chocolate off the leaves. The key word here is gently! Gently people! I gotta say, this was a lot of work, and these pretty little leaves are seriously sensitive to any kind of heat, from your hands, the air or light. I am not sure whether it would have been different if I had been working with normal chocolate and not white chocolate as I hear white chocolate can be very temperamental when things are added to it (i.e. 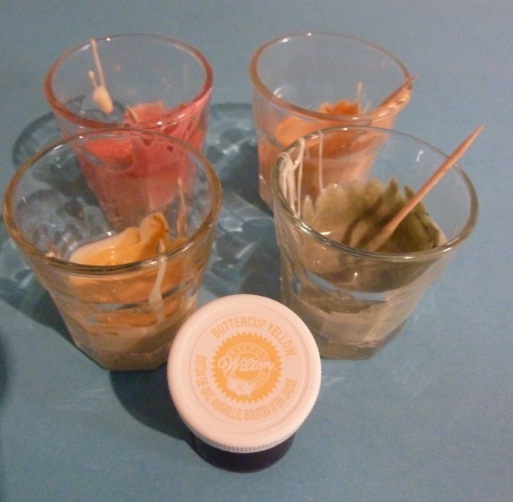 food colouring paste). So I don’t know how long these would last if you didn’t refrigerate your cupcakes. I don’t think I want to find out actually. A bit too much hassle and stress in hoping they survive and not crumble into a million pieces for my liking! Overall, an interesting experiment, the results were a little disappointing but it’s always nice to try a new kind of cupcake decor, even if it didn’t create quite the WOW factor I was looking for. On the other hand, if YOU come up with better results, do send the pics my way!